Calling all pizza lovers out there! 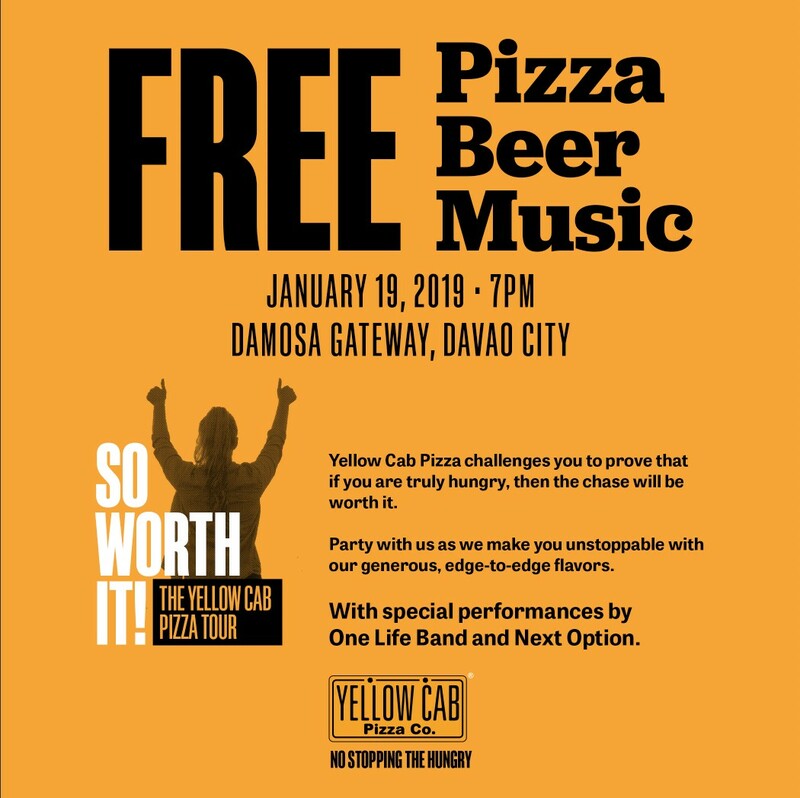 The Yellow Cab Pizza Tour is now coming to Damosa Gateway in Davao City on January 19, 2019 (7pm) giving hustlers down south what they need have a head start in 2019: awesome music and delicious food—all for free! The Pizza Tour will gather music fans, pizza lovers, and hardworking hustlers from across the King City of the South, making them unstoppable with Yellow Cab’s edge-to-edge flavors and performances from their own set of homegrown talents. Up-and-coming trio, One Life Band will be serenading Davaoeños with acoustic song covers, while Pilipinas Got Talent grand finalist, Next Option will captivate everyone's ears with the angelic blending of their voices. It won’t be Yellow Cab without the iconic pizza joint’s all-time bestseller, so guests can expect a free slice of New York’s Finest pizza and a complimentary cup of Heineken Beer when they enter and answer this one simple question, “What is your 2019 goal and what makes it so worth it?”. Participants of the tour’s Davao leg will also receive limited edition Pizza Passes, which they can use to redeem discounts for dine-in purchases made at Yellow Cab stores. Don't forget to like, follow and tag Yellow Cab on social media to stay up-to-date with the latest products and promos.